On Tuesday, November 15th, the highly distinguished Holiday House NYC returned to the Academy Mansion to celebrate it’s 10th anniversary with an extravagant Open House Gala, benefiting The Breast Cancer Research Foundation (BCRF). Each year, more than 20 interior designers transform the four story mansion into fascinating and wondrous displays. This year was no different, with all the rooms exhibiting magnificently re-imagined spaces displaying luxurious modern décor trends. The highly anticipated event drew more than 400 design fanatics to the unveiling of the showhouse, which featured the first-ever kitchen and kids’ room designs to be included at the Academy Mansion showcase. Founded by breast cancer survivor Iris Dankner in 2008, Holiday House NYC has become one of the City’s leading interior design showhouses, and is the first one to raise crucial funds for the prevention and cure of breast cancer. In honor of the 10-year anniversary, Dankner captured the history of the showhouse’s designs in her new book, Holiday House: Ten Years of Decorating for a Cure, which chronicles 10 years of design by over 75 interior. Iris Dankner hosted the opening-night gala and conducted the ribbon cutting. Proceeds from the evening, and from general admission ticket sales, will benefit BCRF. “We salute Iris and the design community for embracing our mission to be the end of cancer by advancing the world’s most promising research. The extraordinary talent on display in Holiday House and the design community’s commitment give us meaningful capacity to fuel progress,” says Myra Biblowit, President & CEO of BCRF. Participating designers included: Robin Baron Design Inc. Björn Björnsson Interior Design LLC, BJS Assoc. Interior Design, Vanessa DeLeon Associates, Genevieve Gorder, Groves & Co., Rio Hamilton, Jacqueline Hosford Interior Design LLC, Young Huh Interior Design, Alyssa Kapito Interiors, Natalie Kraiem Interiors, Patrik Lönn Design, Lucinda Loya Interiors, Magness Design, Mannarino Design Inc., Charles J. Nafie Design, Kim Radovich Interiors, James Rixner, Cheryl Settino Mosher, Cynthia Spence Design, Stedila Design, Touijer Designs LLC, and Jaime Walters. While every room had their own uniqueness and personality, two rooms truly resonated with the guests. The remarkably named Throw Back Thursday (TBT), designed by renowned Brooklyn-based Interior Designer, Jaime Walters, in partnership with leading children’s design brands kinder MODERN and Oeuf created a playful, transitory atmosphere that celebrated the nostalgic memories of Throwback Thursday in the modern world. The bedroom design is both playful and sophisticated, the soft neutrals punctuated with bright colors and plush toys. These elements combine to create a fun, fabulous room that has space for the ever-developing childhood imagination, while referencing youthful nostalgia, and wonder. Another room that caught people’s attention was the “Opposite Day” room, designed by Lucinda Loya. 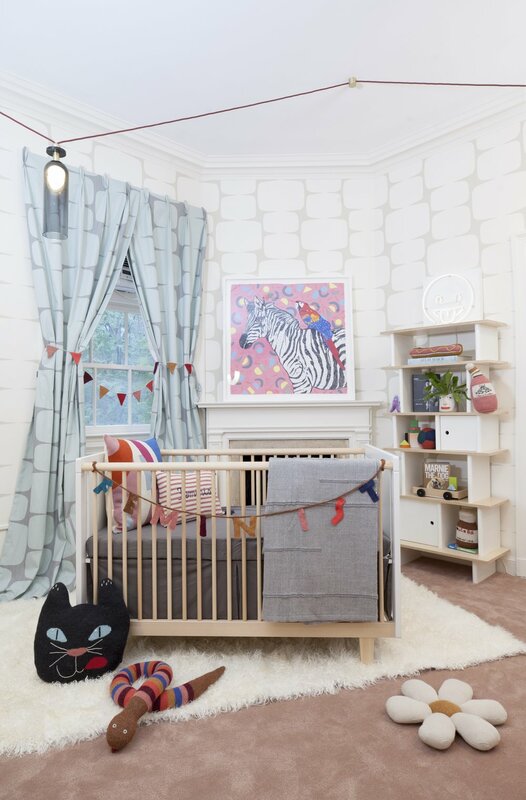 A first time participant in the annual showhouse, Lucinda really showed her artistic edge and her signature playful use of color, pattern and texture. Featuring a timeless, high-contrast palette, her space is indisputably unique and invigorating to the senses. The Juxtaposition of black and white paid a homage to the Hotel Room in Steven Spielberg’s Hotel Room in the film – 2001: A Space Odyssey. The design concept made a striking and memorable impression on the visitors. The designer showhouse will be open to the public through December 6 at the Academy Mansion (2 E. 63rd St.) To visit the showhouse and to support BCRF please purchase tickets here. The Breast Cancer Research Foundation (BCRF) is dedicated to being the end of breast cancer by advancing the world's most promising research. Founded by Evelyn H. Lauder in 1993, BCRF-funded investigators have been deeply involved in every major breakthrough in breast cancer prevention, diagnosis, treatment and survivorship. This year, BCRF will award $59.5 million to support the work of more than 275 scientists at leading medical and academic institutions across 15 countries, making BCRF the largest private funder of breast cancer research worldwide. BCRF is the highest rated breast cancer organization in the U.S.—the only one with an "A+" from CharityWatch and Charity Navigator’s highest rating of four stars. Visit www.bcrf.org to learn more.